In our trainings, one frequently asked question is whether it is also possible to generate user-defined results in MAGMASOFT®. The trainers’ answer is always: “Of course this is possible in MAGMASOFT®”. This is why we have dedicated today’s article to this topic. We hope you enjoy reading the MAGMAacademy newsletter! For users of MAGMASOFT®, we provide news from the support section of our website at the end of this article. There you can read about how to simplify and optimize your work with MAGMASOFT®. In this context, feel free to read a MAGMAtip or watch one of the numerous video tutorials available. Here you will find an overview of the dates for trainings, workshops and seminars. How can I make use of user-defined results for the evaluation? With the broad range of functions of 'User Results' you as a MAGMASOFT® user create your own results and company-specific quality criteria based on existing simulation results. This allows you to effectively expand your standardized evaluation and also adapt the results to the specific problem. In today’s article, we will show you how to focus on critical hot spots in the casting. 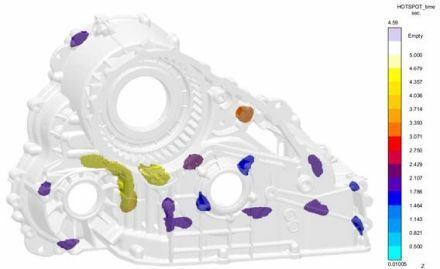 In MAGMASOFT®, the 'Hot Spot' criterion shows you all the areas in the casting where the solidification time differs significantly from the environment. In every hot spot there is an increased risk of porosity formation. Furthermore, the tool enables you to identify residual melt areas in need of feeding. In these cases, the 'Hot Spot' criterion helps you to improve your understanding of the solidification process. Assessing the risk posed by a specific hot spot is difficult based on its size only. A specific user-defined result can assist you in finding a solution for this problem. Based on the original 'Hot Spot' result, you can use the user-defined 'SpotsLimit()' result to not only view the exact time of formation but also the volume or the solidification time. In Figure 2 you can see the comparison between the original and the modified 'Hot Spot' result. You can now use the modified 'Hot Spot' result for the in-depth evaluation of hot spots. The 'X-Ray' function will help you to easily hide non-critical areas. In the present example all hot spots taking less than 1.5 s to solidify are hidden, allowing you to focus on those hot spots taking longer to solidify (see Figure 3). Would you like to find out more about this topic? In this case it is a good idea to attend the workshop “Inverse Optimization and 'User Results'” [LINK] taking place at MAGMAacademy in Aachen, Germany, on April 26 and September 29, 2018 (German language) or December 12, 2018 (English language). In this workshop you can learn about the options available for inverse optimization as well as for creating user-defined results with MAGMASOFT®. Hereby you further adapt your simulations to the reality. In the support section on our website you can now find the newest MAGMAtip on “Simplified Time Inputs” explaining the correct input syntax to simplify the time definition in the simulation. Furthermore, examples illustrate where it is possible to save time when defining process inputs. In the support section you will find the newest video tutorials. For example, take a look at the video on „Create Geometry Alteration Preview“. It will give you an overview on working with evaluation areas. Please find here all Details. Please find here all Details concerning a customized know-how for your company. You receive this newsletter as you are either a customer of MAGMA or you have subscribed to receive it. This mail as well as any attachment is confidential and solely intended for the addressee. If you do not want to receive any information from the MAGMAacademy by e-mail, you can $CANCEL_LINK_SERIES_EN$ It is not necessary to give any reason for this decision. This newsletter was checked of malware. MAGMA GmbH does not accept responsibility for possible damage due to this e-mail.